I recently mentioned Theodore Mommsen's A History of Rome in a posting and a week or so later, while browsing the March 20, 2011, Sunday Boston Globe, noticed an article titled, Titus Wuz Here: Ancient graffiti begins giving up its secrets. I immediately started reading and was expecting to see a reference to Mommsen and maybe, even a reference to Brassai, who I first wrote about earlier this year. For this book collector anytime graffiti is mentioned, these two need to be featured. 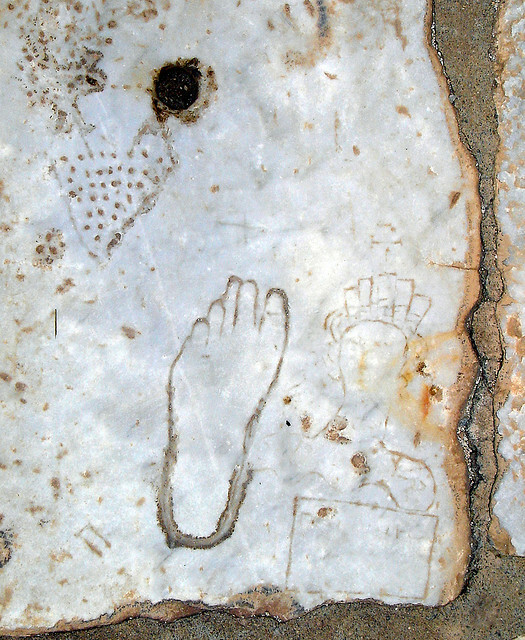 Ancient brothel graffiti advertisement. If your foot is smaller than this, don't bother! While I enjoyed the article and insight, essentially a review of a recently published scholarly study of ancient Roman graffiti , I became annoyed with the tenor, "ancient graffiti begins giving up its secrets"? Ancient graffiti has been giving up secrets since the graffiti was first created! Just the title of the article alone speaks volumes to a tendency today, to arrogantly imagine and often believe, that we are better and know so much more than those that came before. Unlikely, as this brief article from Australia's Reader's Digest proves. Both Mommsen and Brassai, in the mid 19th and 20th century respectively, created defining explorations of graffiti because graffiti has always been a source of insight into the thoughts, customs, concerns and opinions of common people everywhere. An interesting source for all things modern graffiti is http://www.graffiti.org/. For the book collector both Mommsen and Brassai offer wonderful book collecting opportunities concerning graffiti. In Mommsen's case, his 19th century database of Roman inscriptions remains a core research tool for scholars and students of the ancient world. Sponsored by the Royal Prussian Academy of Sciences, now part of the Berlin-Brandenburg Academy of Sciences and Humanities, Theodore Mommsen formed the Corpus Inscriptionum in 1853 and published the first collection of inscriptions from the ancient world in 1863. The Corpus Inscriptionum Latinarum was a massive publishing project originally producing 70 volumes followed by an addition 13 volumes and new inscriptions continue to be included. If you are interested in collecting all the volumes you will need serious shelf space and great patience as at this moment I can only find 2 volumes for sale. One of the those volumes includes my ancestral heritage (maternal) from ancient Samnite lands, now the Abruzzi-Molize region of Italy. The original set of volumes were published in Berlin, G. Reimer. Luckily, there is current on-line access to the database of inscriptions via the official web site and a site that publishes English translations of the Greek and Latin inscriptions. 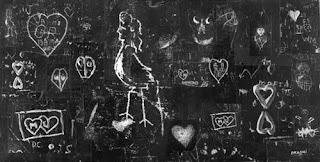 The 20th century photographer, poet and writer, Brassai, also created a fabulous record of graffiti. His book, Graffiti: Text and Photographs by Brassai, Belser-Verlag, Stuttgart, 1960, Éditions du Temps, Paris, 1961, 2nd edition , including a Preface by Gilberte Brassai with writings by Brassai on graffiti including the previously unpublished essay, Le Procés des Graffiti, and a poem, Flammarion, Paris, 1993. The first English translation of Brassai's Graffiti was published by Flammarion in 2002 and remains available today.